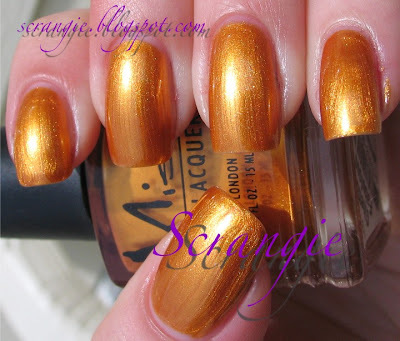 Scrangie: Don't forget about the free polish from Misa! I just wanted to remind you that the Misa promotion is still valid for a while longer! Free Misa Polish: A Gift To My Readers. And just for fun, here are a few more Misa swatches :) I'm working on a ton more, and I'll post them as soon as I can. Thanks for the lovely swatches, Scrangie! Thank you! I've been looking for a swatch of Disco Queen and I couldn't find one anywhere! Great swatches! Moody Model looks like melted milk chocolate! Very cool blog! I just found it, and it rocks! I looove dark shimmers/metallics so Burnished Bronze, A Sin Worth Committing, Chocolate Icing, Sepia Stained Cotton, and Ghetto Fabulous look simply awesome. Thanks for doing a swatch on Dance Fever. I was about to get it on Head2Toe but I was quite skeptical. Wow... the bottle can be deceiving.. ^-^ Thanks again, Scrangie! Just read your update post on the Misa offer - and they ship internationally!!!! I e-mailed Misa almost three weeks ago (before new year) and still no answer. I really do hope that they will answer soon and ship internationally! Danielle_a_k, they are so hot, I love them all! Anonymous, anytime :D I love that color. Glitter rocks! Scrangie is their telephone number toll free to call? My mom will kill me if long distance is charged. Toxic Seduction is beautiful!!! I love your blog, thanks so much. I often refer to before making purchases. Keep up the good job. I called and got great service. I'm eagerly awaiting my box o polish. Even though your swatches are making me second-guess my choices! I did get Toxic Seduction though, and I can't wait! Crap in hand basket why did I have to scroll down to this post. I might need Candy girl. Thanks so much for reposting the info on the Misa polish. I totally forgot about placing an order until I saw the post. Placed my order for 12 bottles a little while ago. Can't wait to get them since I've never tried Misa before. If you call they can tell you which colors are out of stock so you can pick something else while your still on the phone. The amethyst one is stunning! Love it! The Misa - Candy Girl polish reminds of OPI - Princesses Rule. I think the sparkles in Princesses Rule are silver though. The shimmer doesn't reflect light like Candy Girl does. Instead it stays true to color. What do you think? Denny, thank you so much! Penny, wow, that's great! I hope you love them all!